Democratic freshman Rep. Ilhan Omar (D., Minn.) has been holding a series of secret fundraisers with groups that have been tied to the support of terrorism, appearances that have been closed to the press and hidden from public view. Omar recently spoke in Florida at a private event hosted by Islamic Relief, a charity organization long said to have deep ties to groups that advocate terrorism against Israel. Over the weekend, she will appear at another private event in California that is hosted by CAIR-CA PAC, a political action committee affiliated with the Council on American Islamic Relations, or CAIR a group that was named as an unindicted co-conspirator in a massive terror-funding incident. Omar’s appearance at these closed-door forums is raising eyebrows in the pro-Israel world due to her repeated and unapologetic public use of anti-Semitic stereotypes accusing Jewish people of controlling foreign policy and politics. With Omar’s popularity skyrocketing on the anti-Israel left, it appears her rhetoric is translating into fundraising prowess. It remains unclear what Omar has told these audiences in her private talks. 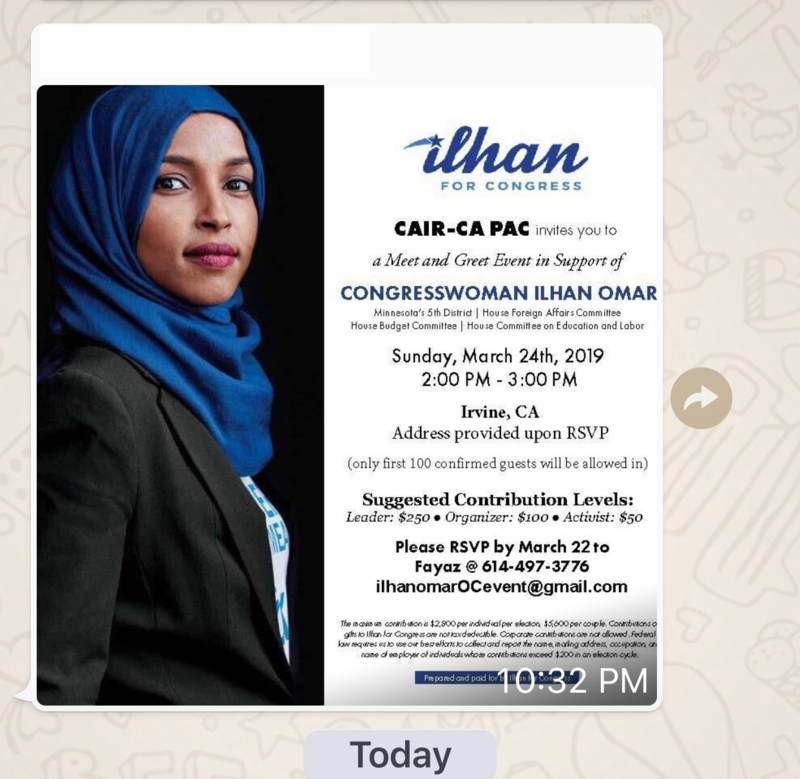 Washington Free Beaconattempts to obtain video of past events were unsuccessful, and multiple local news and television outlets in the Tampa, Fla., area, where Omar spoke to Islamic Relief last month, confirmed they were unable to gain access to the closed door event. Islamic Relief has come under congressional investigation for what lawmakers have described as its efforts to provide assistance to terrorist group such as Hamas and the Muslim Brotherhood. The charity has been banned by some countries as a result of these ties. In 2017, Congress sought to ban taxpayer funds from reaching the charity due to these terror links. A representative from Islamic Relief declined to provide the Free Beacon with any material related to Omar’s appearance. “The event was closed to the media. No materials are available,” the official said. On Sunday, Omar will hold another meet and greet in Irvine, Calif., for CAIR-CA PAC. Those wishing to hear Omar speak are being asked to donate anywhere from $50 to $250 dollars, according to a flyer for the event.